I hope you are doing well.. I am still living on the good ol east side in Cumberland. I have been married for 17 years and have three wonderful children, two boys and a beautiful little girl. My oldest is at Stonybrook. My other son is in 2nd grade attending Brookview elementary. Both are at same schools I went to. The baby girl just turned three in April 2008. I have been involved in the sport of Triathlon and have been racing for the last 12 years at an elite level. Now with 3 kids the time crunch is on so I am just road racing (cycling) since 2003, after I completed the Ironman triathlon. I race with a local cycling team know as the Indiana Hand Center racing team, and yes I am a lycra wearing, shaved legged, 5 thousand dollar bike riding freak and loving it. 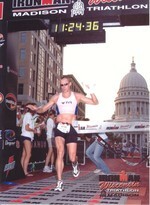 : - ) However, I have begun training and will race the 2010 Florida Ironman. This is going to be my 40th birthday and graduation gift to my self. Yea, a little warped I will admit. I went back to school and graduated with a Bachelor in Business Administration in 2004. Currently I am back in school at Indiana Wesleyan University completing my MBA with a specialization in management. I have been with DHL Global Mail for the last 5 years a division of DHL expresses (The little yellow and red trucks) I have recently taken a new position as Sale Manager for the Indy area. I wish you all the best; please feel free to contact me via this site. Douglas Trumpey has a birthday today.